Looking for a RV toilet? look no further, below a variety of low and high profile RV toilets available on today's market for the RV enthusiast have been listed. These fine products include a wide range of great features such as efficient Water Saver, self-cleaning powerful rim washes, convenient flushing foot pedals, and much much more! If you are seeking a more portable option then you may be looking for a Porta Potty where you'll find a larger selection of portables to best suit your needs. Luxurious and powerful, the Aria Classic features a seat and bowl that is full residential-size. A specialty nozzle with precision allows and enables a high-pressure bowl-cleaning flush. It's more efficient than other brands using only half the amount of water. Includes Water Saver and pedal flush. The seat is high profile at a full 17-1/2"
Elegant, white, and easy to install, Bravura Camper RV toilets have a considerably improved single-pedal flush. They bring with them enhanced features such as increased seat and bowl size, increased bowl depth, easy cleaning made possible by the easy-off seat and cover pod. The efficient Water Saver can be installed either by attaching it to the wall or to the molded-in clip on side. Low Profile Seat height is 13-1/4" and high profile seat height is 17-1/8". 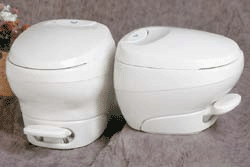 A wonderful replacement toilet for any RV, the China Bowl Toilet is a package of elegant beauty, versatility, and practicality. Inhibiting odor causing bacteria and mold growth is an effective anti-microbial seat keeping your toilet fresh and sterile! Full bowl flush is powerful and provides 100% coverage. Select models include Water Saver and Anti-microbial seat. Seat height for low profile is 13-1/4"and for high profile it stands tall at 17-1/8". 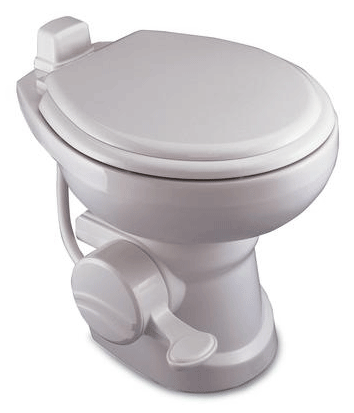 With its glossy vitreous china finish, this gravity king discharge toilet brings a more residential feel to your RV. Although the 510H's water usage is minimal it doesn't hold back, providing exceptional performance for years to come. Great features are included with the Traveler 500H such as a standard height coupled with a deep bowl. 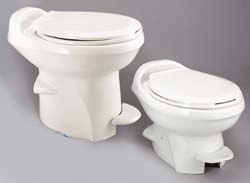 Also great for marine applications, The Dometic Sealand Traveler China Toilets come equipped with a convenient manual foot pedal that makes flushing easy and has a bowl coverage that is the best in its class, providing a powerful rim wash to ensure a clean and complete discharge. 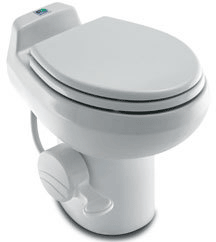 Made with 100% vitreous china, The Dometic Sealand Traveler Lite RV Toilet is beautiful, comfortable and is light in weight. Even though its design is made to fit smaller spaces it's large enough to accommodate a family's everyday use. Features a splash eliminating pressure rim, full-sized seat, and minimal water usage. 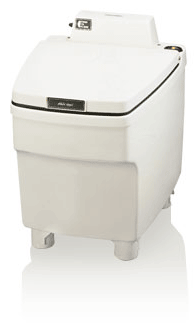 Self contained, quiet flushing with double flow rinsing action, the Electra Magic Recirculating Toilet includes a cone filtration system for operation that is exclusive and trouble-free. Showing charge and content level is the exclusive prismatic level indicator ensuring operation and availability. If the 7 gallon capacity isn't enough, The Electra Magic is capable of remote tank hook-up providing you with extra capacity. 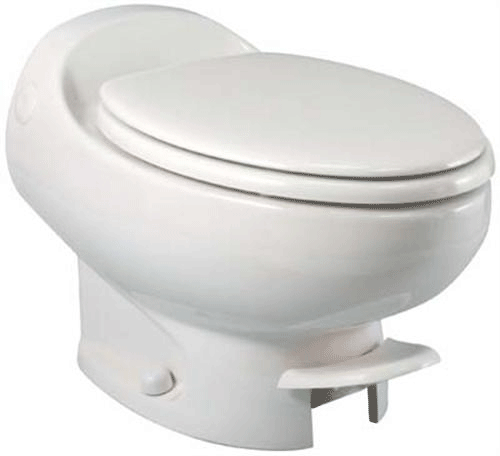 Lightweight and easy to install, This top selling RV toilet features a styling that is classic and a seating height that stands tall at 17-2/5". The Aqua Magic V Foot Flush has a convenient single pedal operation with a water adding half push and a water flushing full push. The Aqua Magic V Hand Flush uses hand lever operation with a water adding half stroke and a water flushing full stroke. Both include a scuff resistant textured lid. Select models includes parchment with Water Saver Hand Sprayer. 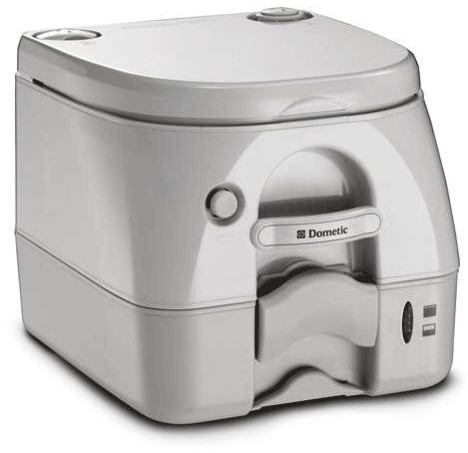 Manufactured with high-density polyethylene the Dometic RV Portable Toilet Potty 970 series is durable, strong, and tough. The matte finish is attractive and scratch-resistant making it easy to clean and looking like new for years to come. Not only is this portable toilet comfortable but it includes side securely latches to lock, providing you with additional safety. Copyright © 2011 RV Toilet. All rights reserved.